Just a little FO this Friday. I had a three hour car ride to kick off my labor day weekend. Only took me 2 hours to complete (in between chatting with the hubby)! 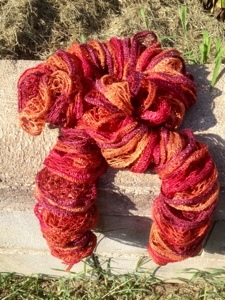 It’s Frilly Knit Scarf by Red Heart made with Red Hearts’ Boutique Sashay in Salsa. I made one small change to the pattern, I only cast on five stitches instead of six. I wanted a little more length and it doesn’t change the look of the scarf very much. Today I’d like you to meet Dex. 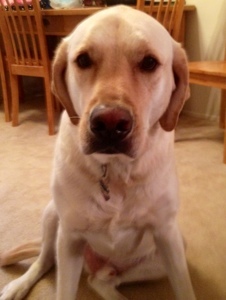 He’s a 3 yr old yellow lab with serious toy issues. Not long after my husband and I got married he started talking about getting a big dog, insert Dex. He was the last of a litter and just the sweetest baby ever. We couldn’t ask for a better dog. He spends many an hour at my side and all he asks for in return is some kibble and a few throws if his favorite toy, the frisbee. We got him his own frisbee golf disc and he chases it to hell and back. When I get home from work he greets me every day with disc in mouth. And weather permitting we exercise every day, great for both owner and dog! He also collects squeaky toys, he’s the only dog I have ever had that doesn’t destroy them. He hoards them from Chloe in his kennel! He may be my husband’s dog, but he’s my baby. He climbs onto our bed every night when i go to ged and guards me until my husband comes to bed. I swear sometimes he thinks he’s people! I know this isn’t a knitting post but I hope you enjoy! Ps…sorry he is pouting in the photo. We didn’t make it to the park for frisbee today and he’s pissed, lol. I’d like you to meet Chloe! 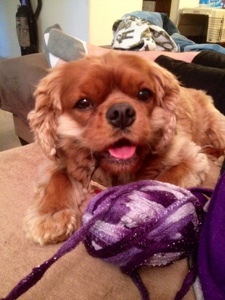 She is a 4 year old Cavalier Spaniel who snores like a grizzly bear and wants to be friends with everyone she meets. She is my sometimes knitting companion when she isn’t too hot to sit next to me. I believe she gets jealous of my knitting because it doesn’t always leave room in my lap for her! My husband and I rescued her from a very nice lady who succumbed to cancer. She can be stubborn and naughty but we have never regretted a minute of it. She can cure my foulest of moods with a simple snuggle and quick kiss. She waits for me everyday in our bay window when I get off work. So here she is and she is pleased to meet you. Chloe will most definitely be part of my future knitting adventures! Just a quick photo of my latest finished object! 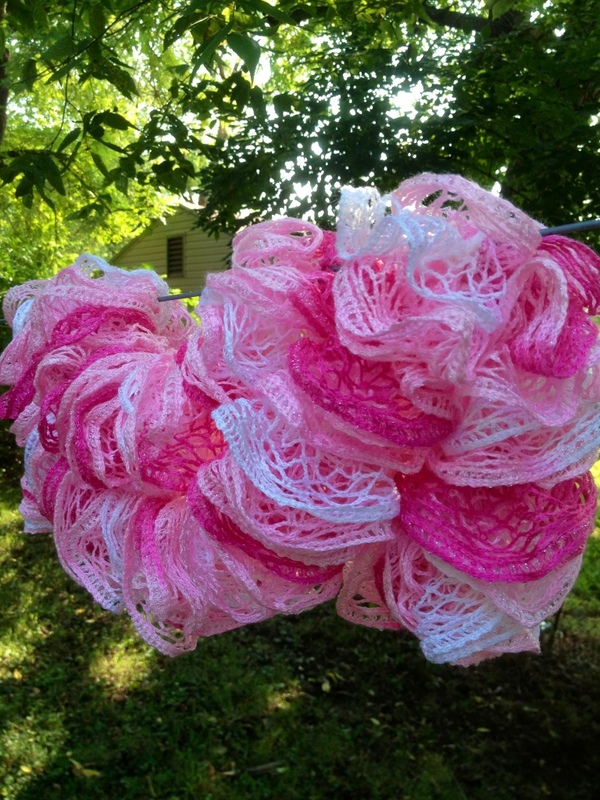 Working on some pink items for a breast cancer awareness fair in October. I have put down the needles tonight to begin my blogging adventure! I have many hobbies including knitting, theatre, volleyball, sewing, and much much more. But I find myself always drawn back to knitting. The simple clickity clack of the needles is deeply soothing and the sense of accomplishment when gazing upon a finished object is beyond compare! So with blog I want to bring you along on the ups and downs of knitting adventures with a few stories of my other hobbies thrown in.